Inter-Dependent Teams: people working together to achieve a common goal. Extra-Dependent Teams: people learning together to develop a common practice. Extra-Dependent Teams: Realising the Power of Similarity reframes the conventional mental model of teams into two complementary mental models of Extra-Dependent and Inter-Dependent Teams. Both types of team operate inside organisations today, but convention doesn’t realise their difference. 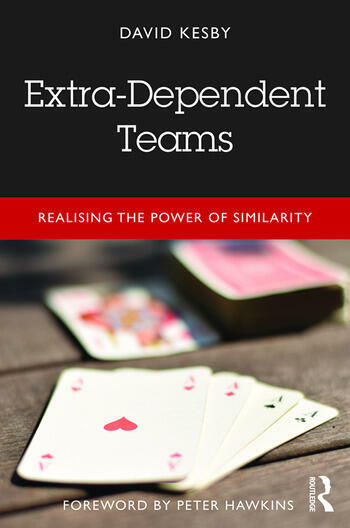 Extra-Dependent Teams are present in organisations because of their similarity – they do similar work in similar ways, but don’t actually work together. People who lead them often feel like they are herding cats. Convention cites them as dysfunctional. But cats don’t herd. They are independent whilst all being the same. Realising this difference provides new ways of understanding and addressing the problems that convention can’t overcome. The reader will be introduced to the distinctness of Extra-Dependent Teams, their dynamics, how they perform, how they develop and how to lead them. Inspired by research on communities of practice and social identity, the book delivers an original and pragmatic approach to teams, being packed with examples, case studies, practical guidance and words of warning for managers and others about how to transform their Extra-Dependent Teams from peripheral problems into engines of innovation and growth. David Kesby has over 20 years’ experience of developing leaders and teams. He is Managing Director of Kesby & Co. Ltd, and an organisational coach.